You can test other two-parameter distributions by changing dist, e.g. to 'logn' or 'gam'. If you want to check one-parameter distribution you have to further remove ,par(2) from the code. 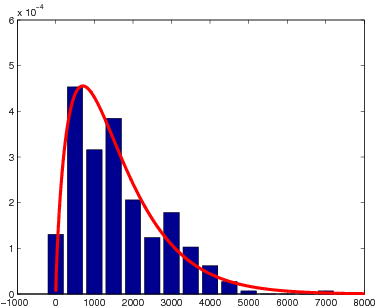 It turns out that also the gamma distribution delivers a fit which is not rejected. This is reasonable because it is sometimes seen as the continuous-valued version of the negative binomial. Also the Weibull distribution was not rejected (although with much lower p-value), this shows that also other models might be appropriate. As always with statistics and real world data, I assume that the KS-Test would reject my theory when we have a larger dataset, as certainly some deviations from the negative binomial trend get dominant (e.g. caused by election cycles). I hope this “finger exercise” on finding a simple stochastic model that fits is inspiring for political scientists, although every political theory would likely immediately reject it.